Add Your Alias, SASS#, and/or message. If no text is desired, type "No Text". Quality Crafted and Big Enough Designed to handle all the gear and clothes you need for a weekend shoot. 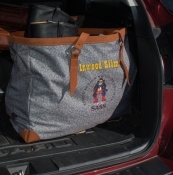 This premium canvas bag is trimmed in leather, has brass buckles and is lined with denim to hide dirt. Sized to fit tall boots, all your cowboy clothes and much more. 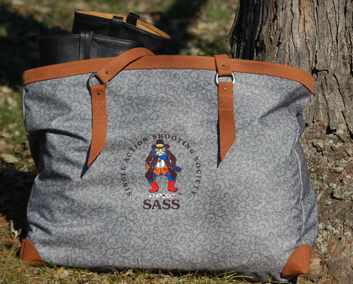 Comes with or without SASS logo. Custom printing is available for any Alias, SASS# and message. We will print in black unless otherwise specified. Allow 4 weeks for delivery. The Cooler Cowboy Shirt by J. Hornaday Dry Goods Cowboy Action Shooting Clothing and Accessories.